San Giorgio Maggiore can be seen clearly from Saint Mark’s Square. It is a landmark building just beyond the entrance to the Grand Canal, yet it is visited by few tourists during their brief stay in Venice. But this 16th-century Benedictine church on an island that shares the same name is of architectural importance for it was designed by the great architect of Venice, Andrea Palladio. The church, which was built between 1566 and 1610, is a basilica in the classical renaissance style. 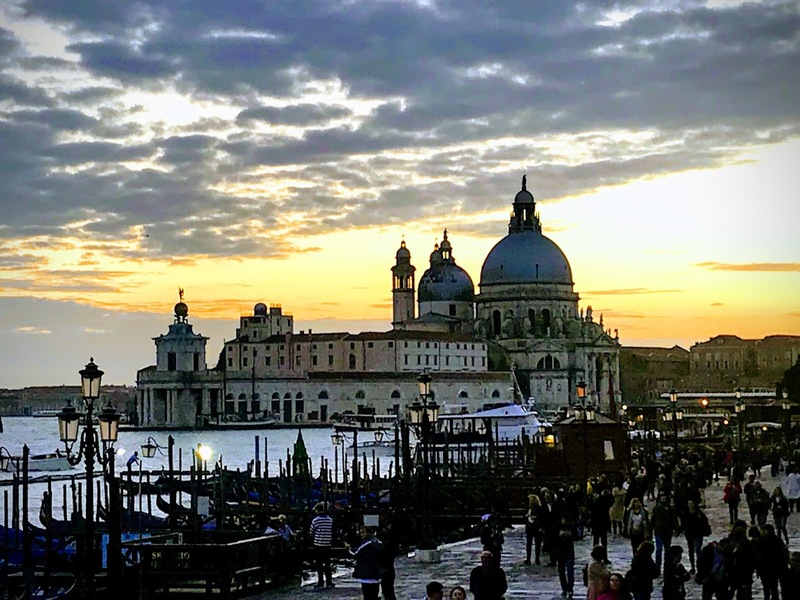 Its white marble gleams above the blue water of the lagoon opposite the Piazza San Marco, and it forms the focal point of the view from every part of the Riva degli Schiavoni. The first church on the island was built about 790, and in 982 the island was given to the Benedictine order by the Doge Tribuno Memmo. The Benedictines founded a monastery there, but in 1223 all the buildings on the island were destroyed by an earthquake. The church and monastery on the island were rebuilt after the earthquake. The church, which had a nave with side chapels, was not in the same position as the present church, but stood farther back at the side of a small campo or square. The cloisters in front of were demolished in 1516, and from 1521 the monks began planning to rebuild the church. Palladio arrived in Venice in 1560, when the refectory of the monastery was being rebuilt. He made great improvements to this, and in 1565 he was asked to prepare a model for a new church. The model was completed and approved in 1566 and the foundation stone was laid in the presence of the Pope that year. 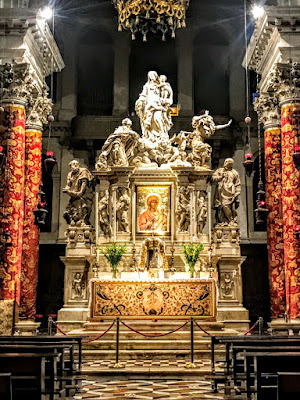 The work was not finished before Palladio died in 1580, but the body of the church was complete by 1575 apart from the choir behind the altar and the façade. The decoration of the interior was completed later. The choir appears to have been designed in essentials by Palladio before his death and was built between 1580 and 1589. Work on the façade, initially built with Simone Sorella superintending the project, did not begin until 1599. The stonemason’s contract insisted on following Palladio’s model and only minor changes were made before it was completed in 1610. It is a curious fact that although the campanile or bell tower is a landmark on the skyline of Venice, not designed by Palladio. It was first built in 1467, fell in 1774, and rebuilt in neo-classic style by 1791. From the top of the campanile there are fine views across Venice and the Lagoon. The façade of the church is a brilliant white and represents Palladio’s solution to the difficulty of adapting a classical façade to the form of this church, with its high nave and low side aisles. Palladio’s solution was to superimpose two façades, one with a wide pediment and architrave, extending over the nave and both aisles, apparently supported by a single order of pilasters, and the second with a narrower pediment that is the width of the nave and that is superimposed on it with a giant order of engaged columns on high pedestals. This solution is similar to Palladio’s slightly earlier façade for San Francesco della Vigna, where the other parts of the church had been designed by Sansovino. On either side of the central portal are statues of Saint George and of Saint Stephen, the patrons of the church. Inside, the church is bright, with massive engaged columns and pilasters on undecorated, white-surfaced walls. The interior combines the long nave of a basilica with a cruciform plan with transepts. The chapel to the right of the high altar once belonged to the Bollani family, whose members included Domenico Bollani, once ambassador to King Edward VI of England and later a bishop. A chapel associated with the Morosini family, who gave their name to the Morisini fountain in Iraklion in Crete, is dedicated to Saint Andrew. Here a painting by Jacopo and Domenico Tintoretto depicts ‘The Risen Christ and St Andrew with Vincenzo Morosini and members of his family.’ Other works in the chapel are by Jacopo and Domenico Tintoretto and Leandro Bassano. 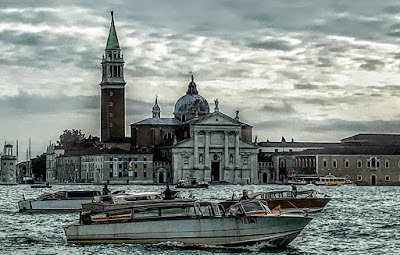 At the end of a day that involved two boat trips the full length of the Grand Canal, as darkness closed in on Venice late yesterday [6 November 2018], I stopped for a while to visit Santa Maria della Salute at the southern-most entrance to the Grand Canal. The dome of the Salute is an emblem of the skyline of Venice and this church and its silhouette have inspired artists from Canaletto to Turner and Sargent. This baroque church stands between the Grand Canal and the Giudecca Canal, at the Bacino di San Marco, on the narrow finger of Punta della Dogana. It can be seen clearly from the waterfront at the Piazza San Marco. 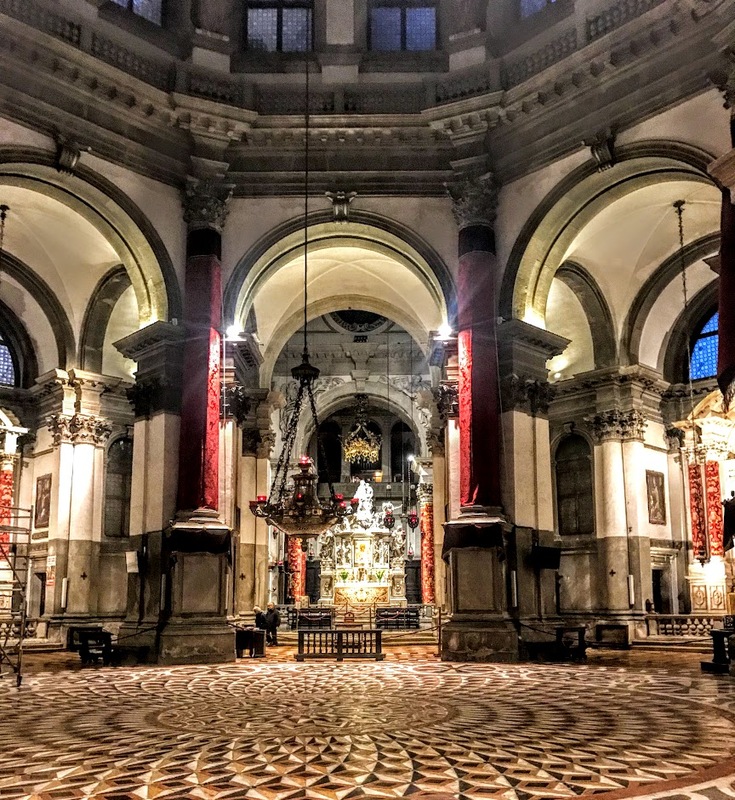 Although Salute is best-known for the dome that makes it an architectural landmark, its spacious, light-filled interiior – like so many churches in Venice – is filled with artistic treasures. So often, people raise their glasses in Italy with the toast Salute!. It might be too easy to translate this as ‘Cheers!’ or ‘Your health!’ But the name of this church is associated with prayers for the health of Venice and deliverance from the plague almost 400 years ago. 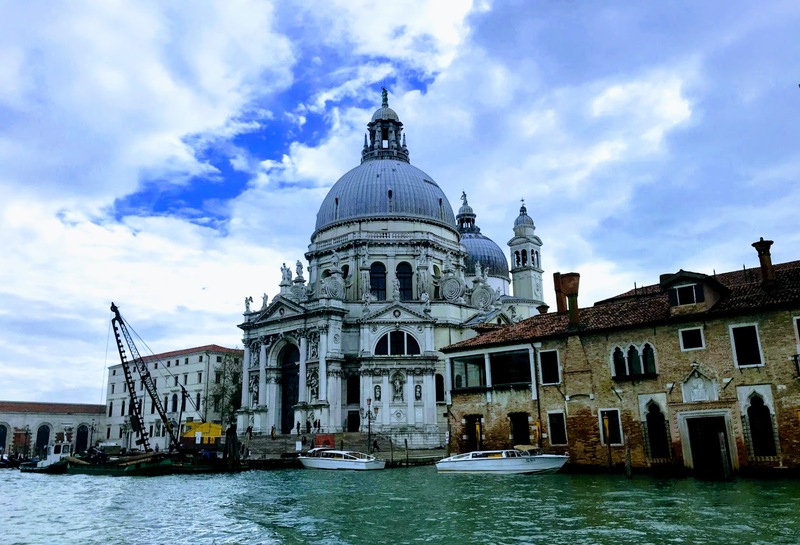 The Salute is one of the so-called ‘plague churches’ in Venice and its full name is Santa Maria della Salute: Saint Mary of Health, or Saint Mary of Deliverance. After Venice was devastated in an outbreak of the plague in 1630, the Serene Republic agreed to build a church dedicated to Our Lady of Health or of Deliverance as a thank-offering for the city’s deliverance. The church was designed by the architect Baldassare Longhena, who studied under Vincenzo Scamozzi. Venice was devastated by a the plague in a wave that began in the summer of 1630 and continued into 1631, killing almost one-third of the population of the city. In all, 46,000 people died in the city, and 94,000 more died in the lagoon and the surrounding islands. 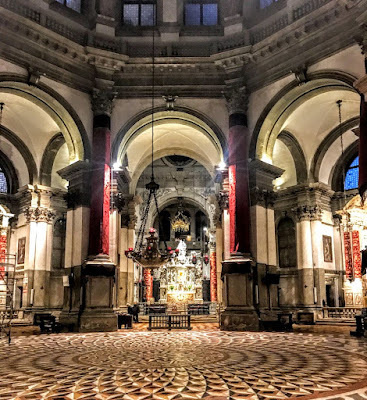 As they prayed for an end to the plague, the people of Venice held processions and public displays of the Blessed Sacrament, with processions to the churches of San Rocco and San Lorenzo Giustiniani. 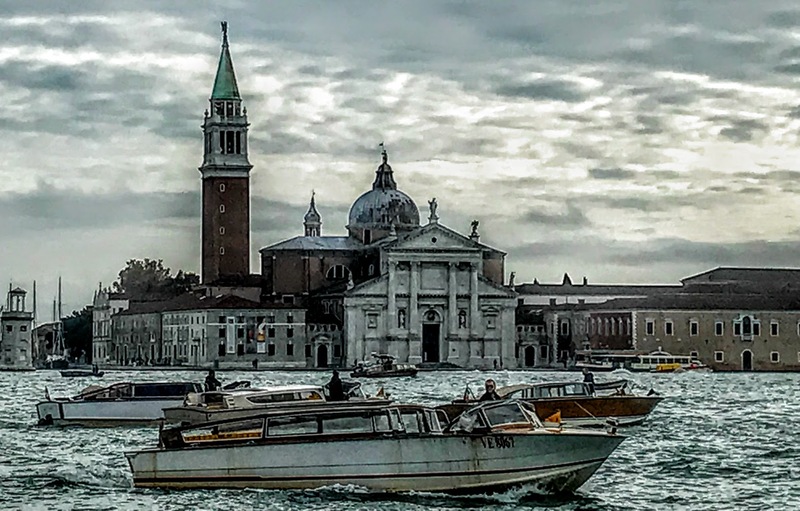 Over half a century earlier, during another plague attack in 1575-1576, the city had responded by commissioning Andrea Palladio to design the Church of Il Redentore (the Redeemer) on Giudecca. On 22 October 1630, Church and State responded as the Venetian Senate decreed that a new church should be built, dedicated not to a another ‘plague’ saint or patron but to the Virgin Mary, who was revered as a protector of the Republic. But the Senators also wanted a monumental church in place that could be reached easily from Saint Mark’s Square. The locations was chosen from among eight potential locations, partially because it was possible to link it with San Giorgio, San Marco, and Il Redentore, and the four churches form an arc in Venice. 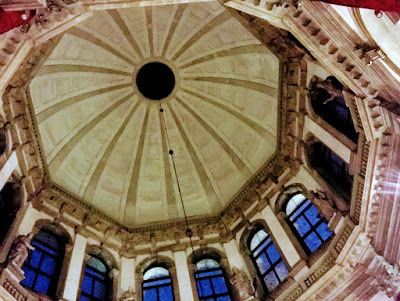 The Salute also stands close by the custom house or Dogana da Mar, the symbol of the maritime commerce of Venice, and near the civic centre of the city. The Patriarch of Venice opposed the location of the church at first. He owned a church and seminary that stood on the site until the dispute was resolved. Eventually, building work began in 1631. The architect Baldassare Longhena was only 26 when he was chosen by the Senate in a 66-29 vote to design the new church. The Salute was novel in many ways, showing the influence of Palladian classicism and the domes of Venice. But this octagonal church is also influenced by Byzantine designs, including the Basilica of San Vitale in Ravenna. Salute is a vast, octagonal building with two domes and a pair of bell-towers, designed by Longhena as a crown-like church. However, the decorative circular building also looks like a reliquary, a ciborium, or an embroidered, inverted chalice that shelters the piety of Venice. It is full of Marian symbolism: the great dome represents her crown, the cavernous interior her womb, and the eight sides the eight points on her symbolic star. Salute stands on a platform made of a million wooden piles, and is built of Istrian stone and marmorino or brick covered with marble dust. At the top of the pediment, a statue of the Virgin Mary presides over the church. The façade is decorated with figures of Saint George, Saint Theodore, the Four Evangelists, the Prophets, and Judith with the head of Holofernes. Recently, the statues of the four evangelists have been identified as the work of Tommaso Rues. Inside, the church is octagonal with eight radiating chapels on the outer row. 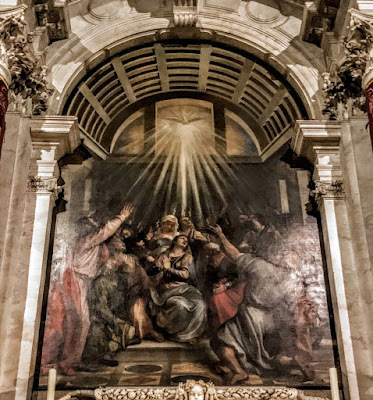 The three altars to the right of the main entrance are decorated with scenes from the life of the Virgin Mary by Luca Giordano: the Presentation, the Assumption and the Nativity, and there is a painting by Titian of Pentecost or the Descent of the Holy Spirit. Longhena himself designed the Baroque high altar, which displays a 12th or 13th century icon from Crete of the Virgin Mary and the Christ Child, known in Greek as Panagia Mesopantitisa, the ‘Virgin Mediator’ or the ‘Virgin Negotiator.’ The icon was brought to Venice from Iraklion in 1669 when the capital of Crete was captured by the Ottoman Turks. The group of statues above the high altar shows the Virgin Mary as Queen of Heaven driving the Plague out of Venice. This theatrical Baroque masterpiece was executed in 1670 by the Flemish sculptor Josse de Corte. Tintoretto painted the ‘Marriage at Cana’ in the great sacristy, which includes a self-portrait. Titian painted Saint Mark Enthroned with Saints Cosmas, Damian, Sebastian and Roch, seen in the altarpiece in the sacristy, as well as ceiling paintings of David and Goliath, Abraham and Isaac and Cain and Abel, and eight tondi of the eight Doctors of the Church and the Evangelists, all in the great sacristy, and the Pentecost in the nave. Longhena’s last great work in Venice before he died is the Ca’Pesaro, a colossal baroque palace on the Grand Canal. The Senate agreed to visit the church each year. 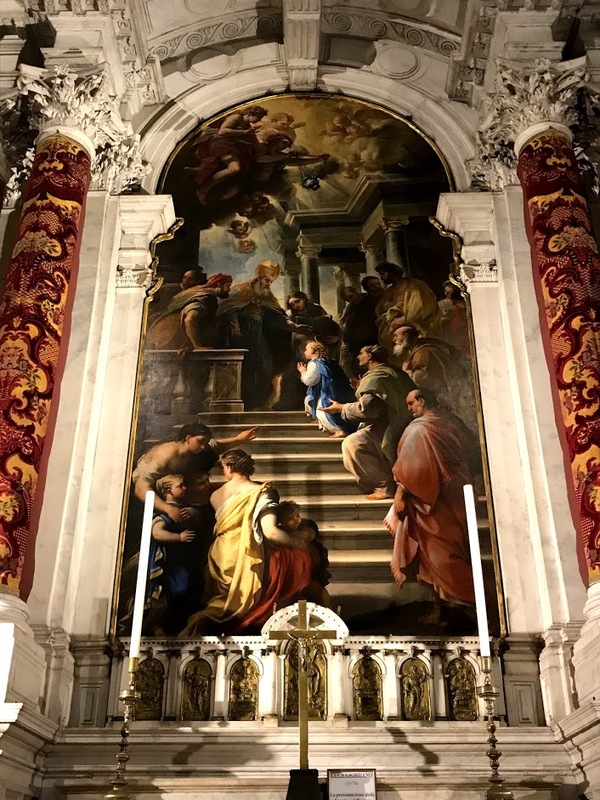 On 21 November, the Feast of the Presentation of the Virgin, or the Festa della Madonna della Salute, the city officials paraded from San Marco to the Salute for a service in gratitude for deliverance from the plague is celebrated. This involved crossing the Grand Canal on a specially-built pontoon, and this parade is still a major event in Venice each year. As time passed, the dome of the Salute became an important landmark on the Venetian skyline and it soon became an emblem of the city, inspiring painters from Canaletto (1697-1768) to JMW Turner (1775-1851) and John Singer Sargent (1856-1925).